Ever since the California Legislature and Department of Health defined “public pools” to include pools within private homeowner associations (HOAs), enforcement measures to properly maintain HOA swimming pools up to code have increased statewide. Non-compliance has resulted in fines. 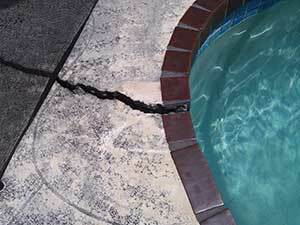 At JH3 Company we work with Los Angeles County HOAs concerned about their ageing swimming pool decks that have surface cracks and rebar rusting through broken sections. Not surprising, as the hot summer months approach and temperatures soar, we see an increase in calls from HOAs directly or property management companies (PMCs) in charge of maintaining HOA swimming pools. As a “one-stop shop” who does not sub anything out to other resurfacing and commercial waterproofing contractors, we can repair the surfaces of HOA pool decks so they are up to code and in compliance with California state and local city building codes. We resurface the surrounding deck and coping, but do not resurface the plaster inside the pool. Cracks from shrinkage, structural problems or concrete product failures. Every swimming pool deck is unique in its own right so the extent of repairs needed varies for each HOA. For example, if the extent of damage is extreme, a complete resurfacing of the swimming pool deck may be in order. We know how to take every measure to waterproof swimming pool decks so its surface has a firm, flexible, weather-tight seal that resists abrasion, weathering and moisture. Recurring cracks are never guaranteed in all pool resurfacing work, but we can incorporate them into a design most of the time if they are active. We use several products to waterproof swimming pool decks with concrete substrates, but we prefer to install Pli-Dek systems. Pli-Dek is more expensive but offers superior durability and low maintenance for high traffic swimming pool decks where waterproofing and durability is essential. If you are not sure whether your HOA swimming pool in Los Angeles County is up to code, or is satisfactory condition for the California Legislature and Department of Health, feel free to contact us for a complimentary estimate.